1) 'Scaredy Squirrel Prepares for Halloween' by Melanie Watt. We love Scaredy Squirrel so much in this house! Scaredy Squirell takes worrying to a whole new level. I so relate! He follows my motto always: Always be paranoid and prepared. 2) 'The Ghastly Dandies Do the Classics' by Ben Gibson. Ok I saw this one and was like, what the what is this? It's HILARIOUS is what it is. Just wait till you get to the Sherlock Holmes part. Now, this is only really funny if you've read the classics that this book is parodying, but the art is so fun that the kids won't care, they'll just like the silly hijinks of some very cute monsters. But seriously, the Sherlock Holmes part.....SO FUNNY! 3) 'Humbug Witch' by Lorna Balian. Is a great favorite from Julia's preschool and toddler days. Such a neat book about a witch going about her day, making potions, playing with her kitty, but darn it all she can't get her spells to work! And then at the end of day when she gets tired.....all the hair and makeup comes off and a little girl calls it a day with her dress-up costume. So adorable for tiny tots! 4) 'The Scary Places Map Book: Seven Terrifying Tours' by B.G. Hennessy and Erwin Madrid is very neato mosquito. I think next year when Julia is one year older, I'm going to buy this one. Which is funny because the School Library Journal gave it an absolutely scathing review on Amazon, I was so surprised! I thought this was so cool, what's not to like about maps and scary places?? I've seen it in person and I loved it. 5) 'Friends' by Mies van Hout. Oh my spookies, I LOVED this one and I'm going to get it for my toddler nephew. Mies van Hout has come out with a followup to her amazing book 'Happy'; this time she depicts sweet monstery creatures whose facial expressions illustrate common words pertaining to friendship. (Like 'boredom', 'cuddling', 'teasing' etc...) It's amazing how well she nails the facial expressions that go with each feeling. Guess what my spookies! I'm not done! 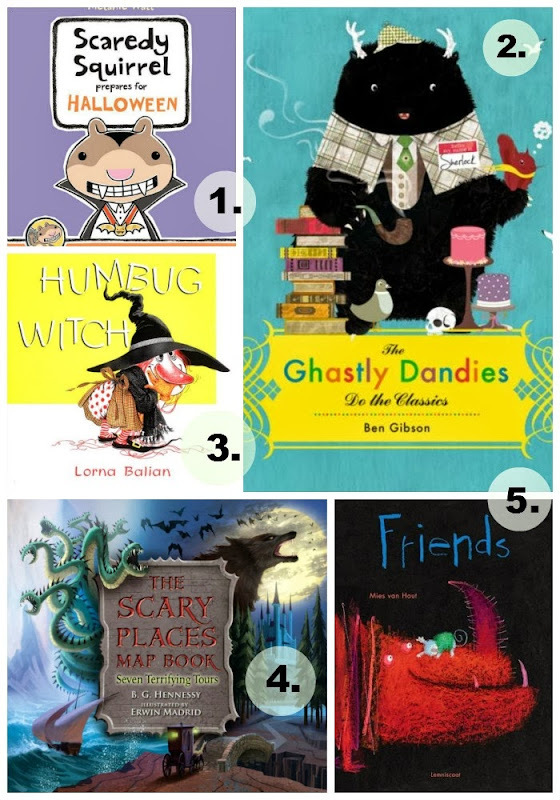 I'll have more Halloweeny books for you next week. The Humbug Witch gets my total attention with such a cute storyline! I am not crazy about Halloween book but I like cutesy witches! Awwww #2 is sooooooooo cute. it's adora-BOO! ha ha ha! Oh dear me, I must find The Ghastly Dandies! That looks too fabulous. They all look great, actually! I bet your boys would like the one about the maps!!! !